Nature’s Healthy Gourmet, Inc. specializes in all vegetarian recipes. 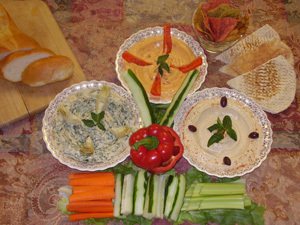 We produce and sell FRESH hummus, dips, spreads, salads, mashed potatoes, falafel, soups, spinach pies, and more. You can find our products in all Whole Foods locations and various other gourmet and health stores in the state of Florida. Our products are packaged in individual, family size containers, and in bulk. Nature’s is committed to serve you the best of the best. Our food is always prepared Fresh on a daily basis, and everything we produce is made and supported locally. We use only the highest quality ingredients that offer the very best in homemade flavors and that look and taste like they were made one package at a time. We never stray from our authentic recipes. 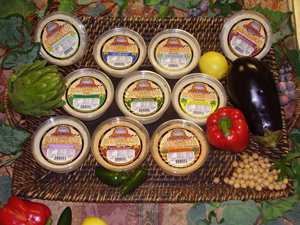 Our products are a healthier alternative to traditional snack foods and dips. We are also constantly working on new tasty and healthy culinary ideas. 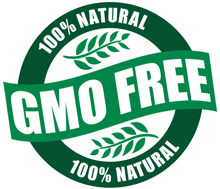 All ingredients used in our recipes and products are GMO Free. We are in the middle of a project to re-design our labels. This project will be finished by September of 2018. Please be patient with us, we are a small company and we are trying to complete this project without having to increase our prices to our loyal customers. Nature’s Healthy Gourmet, Inc. has always believed that high quality must be the most important goal when we put a product on the market. One way to accomplish this is for us to prepare your food in accordance with Jewish dietary laws. We take great care to ensure our facility and products follow rigorous Kosher standards. We are certified to produce Parve products under the supervision of The Orthodox Rabbinical Board of Broward and Palm Beach Counties (O.R.B. ).